This week is Star Wars, Star Wars, Star Wars as Wes returns from the Celebration event in Anaheim, eager to ruminate on DICE's upcoming shooter. How will it compare to Battlefield? Should it be pulling in the Expanded Universe? 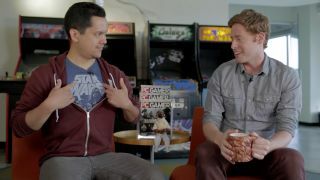 To tackle some of these questions, fellow Star Wars superfan Lorenzo Veloria of GamesRadar+ stops by and imparts some Jedi wisdom. Actually, he mostly just geeks out about Star Wars. But that's just how these things go, sometimes. Enjoy some footage from the show floor of Star Wars Celebration Anaheim! There were a lot of stormtroopers.